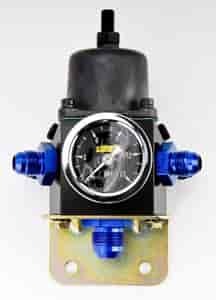 Holley Fuel pressure regulators are used to adjust the fuel pressure for use with various carburetors. Too much fuel pressure for a given needle and seat assembly may cause flooding or drivability problems. Jegs Easy Kits are designed by Jegs Professionals to help you get all the performance parts you need. This kit includes a Holley 4-Port Fuel Pressure Regulator and a 0-15 psi black face Jegs Fuel Pressure Gauge 555-41010.